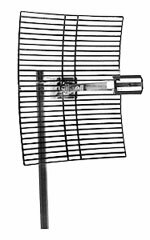 This antenna's construction features a Cast Magnesium Alloy reflector grid for superior strength and light weight. be installed for either vertical or horizontal polarization. Alloy reflector grid for superior strength and light weight. 16" x 20" x 15"